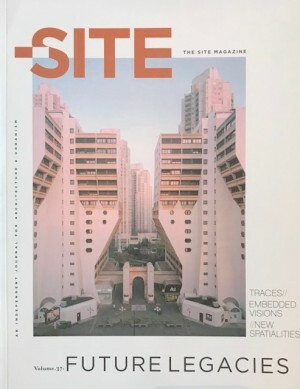 The Site Magazine’s current editorial cycle (2016-2018) was initiated with its rebranding and will close with its 20th anniversary issue. The six volumes published within this editorial cycle focus on varied devices: the conceptual tools architects use to address societal issues at a range of scales. Volume 35 discussed borders as a device with a growing palette of built manifestations that divide and define populations at the global scale. Volume 36: Vernaculars developed a new lexicon for informal design responses at a territorial scale. The forthcoming volumes 37 and 38,Future Legacies and Feminisms, will confront the national and the urban scale respectively, celebrating the Canadian sesquicentennial by addressing the constructs of a national project (Future Legacies) and aligning feminist and urban discourse out of a concern for the vulnerability of marginalized communities and an overall interest in inclusivity (Feminisms). Toronto, 2017, 22x28cm, 211pp. illustrated, Paperback.